"RTX Developer" is the trade name for Ruthenium Tetroxide (RTX) solution, a product for developing latent fingerprints on a variety of unusual substrates. The working solution contains Reutenium Tetoxide dissolved in a special organic solvent. This mix of chemical components results in a solution that will develop latent finger/palm impressions. RTX fumes react with organic compounds such as oils or fats (hence the development of prints on wet items) and turns them into brown or black solids. 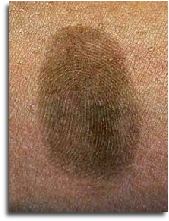 As latent prints contain fatty oils, the RTX reacts with the deposits resulting in the development of latent marks. RTX developed fingerprints on a piece of usual paper. 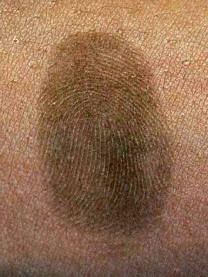 ●RTX can develop fingerprints on human skin. ●The black deposits can be removed enabling further sequential processing. ●RTX is a very sensitive compound developing clear fingerprint impressions. ●Full MSDS information is available, the solution is safe to use on ‘live’ human skin. ●The RTX solution can develop latent fingerprints on difficult surfaces where other conventional processes are ineffective. human skin, usual paper, thermal paper, clothes, leather, glass, plastics, both sides of adhesive tape and vinyl tape, wooden goods, metal, stone, wall, etc, and these substrates with wet surfaces.